A hunk of seasoned pork twists on a vertical spit, a hubcap like cylinder braises beef, chorizo and lengua with tubs of salsas, onions and cilantro awaiting at a nearby table. This is the taco cart. A fixture in the east side neighborhoods of Los Angeles. The taco cart does not have a menu or a name. It is often an extension of the community where loyal customers know the cooks on a first name basis. 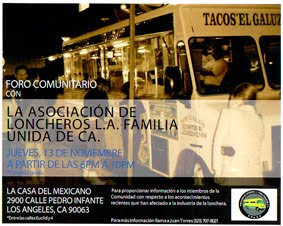 You’ll find taco carts or as they are sometimes called taco tables at many parks in East LA and on the busy avenues and boulevards of the eastside. 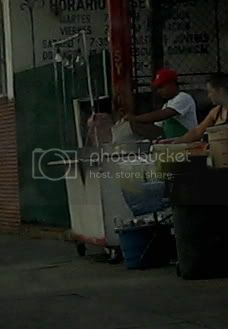 The western most taco cart in LA that I am aware of is the taco cart at Vermont and Venice Blvd. A favorite of LA chowhounder known as Dommy, this taco cart sets up shop nightly around 8pm and burns the fire well into the night. 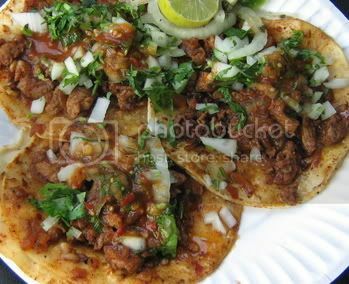 I order three tacos al pastor and watch as the pork is cut from the spit and sizzles on the grill next to a mound of grilled onions and corn tortillas that soften from the pork drippings. In one motion the pork is soaked up with the soft tortillas and put on to the plate. The chef has the motions down to a science and makes it look like an artform. The pork is tender and juicy staining the toasted corn tortillas . The juice from the pork and the salsa combine together into a luscious gravy that soaks into the top tortilla and gives the taco great texture. The roja doesn’t make me reach for my cold beverage but it provides good balance. The taco cart is the quintessential street taco. 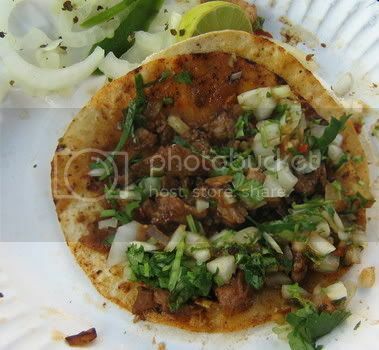 From the streets of Mexico City, to Tijuana to the streets of East Los Angeles there is this common attitude that derives from the street taco. The taco cart is the product of impulse. It pulls you in and seduces you. And when you stand on the street corner with a plate of tacos with the traffic jam right in front of you but so far away you may realize that for this moment you are not in that marching order of monotony waiting for the next light to turn green. You've pulled over to the side of the road because as the fellas at TACO have so fittingly put it. You live the taco lifestyle. Okay Bandini-- Here's the question of the day from a foreigner. Someone is coming to LA for the first time who has never eaten a taco in his life but reads your blog with the greatest pleasure. If you were to take me for a night on the taco town, where would we go and what what you order me to eat? I'm serious. If I can't have you as a private tour guide, at least I can get recommendations from the man himself. After reading such positive reviews about this Taco Table on Chowhound, I am a little surprised that their tacos only earned 3.5 "Tacos" by Bandini. Man, those look good. I miss Los Angeles. I am going to be home in December and I am definitely going to have to try these places out. Man, I'd like a dozen of these al pastors delivered immediately to my house in Toronto! Heck, send the whole taco cart! I am an East LA native dying for this kind of action. I can't even get more than two or three posts into your blog because I'm drooling too much. El Parian for the carne asada. Then we'd cleanse the palate at a pub with a few pints of ale then a late night taco crawl to el taurino for that spicy salsa roja.